On the sudden death of Timur, at Otrar, on the river Sihun, Sir (the ancient Jaxartes), the 18th February, 1405, his empire extended from Smyrna, on the Mediterranean, to Delhi and Patna, on the Ganges, and from the Don and Terek to the Nile and Indian Ocean. Samarkand and Kesch were his capitals, which he adorned with magnificent mosques and bazaars. The Great Khan himself, with all his court, lived encamped under tents, in the environs of these cities; the most extravagant luxury was introduced, and the splendor of dresses and furniture surpassed all belief. The celebrated armorers of Damascus and the silk weavers of India were transported to Samarkand, which rose as the center of Asiatic commerce in communication with Russia, China, and the countries on the Mediterranean. Yet his numerous sons immediately divided his empire ; they refused to recognize his nephew, Pir Mohammed Dschihangir, as their sovereign, and thus many smaller dynasties wero formed. 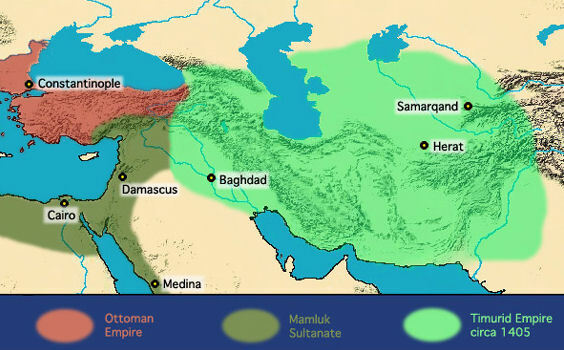 The Ottomans reconquered Asia Minor; the Turkomans, Persia; the Mamlukes returned from Egypt, while the Timurid Chiefs of Upper Asia were, by endless wars, circumscribed to Eastern Persia, Chorasau, and Kandahar, until they too, in their turn, sank. Timur died in the seventieth year of his age and about to invade China. Besides exercising sovereignty over Transoxiana and those vast regions more or less absorbed in Asiatic Russia of the 19th century, and inclusive of the Caucasus, Astrakhan and the lower Volga, and overrunning Mesopotamia, Syria, Asia Minor, Afghanistan and India, he had at this time left his indelible mark upon the chief cities and provinces of Persia. Khorasan and Mazandaran had submitted to him in 1381, Azerbaijan had shortly after followed their example, and Isfahan was seized in 1387. From Isfahan he passed on to Shiraz, and thence returned in triumph to his own capital of Samarkand. Five years later he subdued Mazandaran, and later still he was again at Shiraz, having effected the subjugation of Luristan and other provinces in the west. It may be said that from north to south, or from Astarabad to Hormuz, the whole country had been brought within his dominion. After the death of Timur, Sultan Ahmad the Jalayr in part recovered possession of his dominions. In Iraq, political chaos, severe economic depression, and social disintegration followed in the wake of the Mongol invasions. Baghdad, long a center of trade, rapidly lost its commercial importance. Basra, which had been a key transit point for seaborne commerce, was circumvented after the Portuguese discovered a shorter route around the Cape of Good Hope. In agriculture, Iraq's once-extensive irrigation system fell into disrepair, creating swamps and marshes at the edge of the delta and dry, uncultivated steppes farther out. The rapid deterioration of settled agriculture led to the growth of tribally based pastoral nomadism. By the end of the Mongol period, the focus of Iraqi history had shifted from the urbanbased Abbasid culture to the tribes of the river valleys, where it would remain until well into the twentieth century. The third son of Timur, Miran Shah, had ruled over part of Persia in his father's lifetime; but he was said to be insane, and his incapacity for government had caused the loss of Bagdad and revolt in other provinces. His claim to succession had been put aside by Timur in favor of Pir Mahommed, the son of a deceased son, but Khalil Shah, a son of the discarded prince, won the day. His waste of time and treasure upon a fascinating mistress named Shadu '1-Mulk, the "delight of the kingdom," soon brought about his deposition, and in 1408 he gave way to Shah Rukh, who, with the exception of Miran Shah, was the only surviving son of Timur. In fact the uncle and nephew changed places - the one quitting his government of Khorasan to take possession of the Central-Asian throne, the other consenting to become governor of the vacated Persian province and abandon the cares of the empire at Samarkand. In 1409 Khalii Shah died; and the story goes that Shadu '1-Mulk stabbed herself and was buried with her royal lover at Rai, one of the towns which his grandfather had partly destroyed. Shah Rukh, the fourth son of Timur, reigned for thirty-eight years, and appears to have been a brave, generous, and enlightened monarch. He removed his capital from Samarkand [in modern Uzbekistan] to Herat [in the west of modern Afghanistan], of which place he rebuilt the citadel, restoring and improving the town. Merv also profited from his attention to its material interests. Sir John Malcolm speaks of the splendor of his court and of his encouragement of science and learning. He sent an embassy to China; and an English version of the travels to India of one of his emissaries, Abd ur-Razzak, is to be found in R. H. Major's India in the Fifteenth Century (London, Hakluyt Society, 1857). Sultan Hosain Mirza, great-grandson of Omar Sheikh, son of Timur, reigned in Herat [in the west of modern Afghanistan] from 1487 to 1506. He was a patron of learned men, among others of the historians Mirkhond and Khwadamir, and the poets Jami and Hatifi. But at no time could his control have extended over central and western Persia. The nearest approach to a sovereignty in those parts on the death of Abu Sa'id is that of Uzun Hasan, the leader of the Ak Kuyun, or "White Sheep" Turkomans, and conqueror of the "Black Sheep," whose chief, Jahan Shah, he defeated and slew. Between the two tribes there had long been a deadly feud.